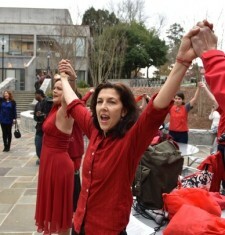 Lori Teague is the director of the Dance Program at Emory University, an independent choreographer, activist and environmentalist. She continues to invest in a variety of ways in which movement can empower an individual, build new connections between people, and strengthen an awareness of our natural world. Teague met the family of Moving in the Spirit in 1992 and became passionately aligned with their philosophy and mission. Her choreography Speak, created with Moving in the Spirit teaching artists in 1997, has been presented numerous times throughout the southeast as well as in Scotland and Russia. In addition, Moving in the Spirit alumni performed Speak at the 2012 TEDx Centennial Park Women illustrating The Space between Inhibition and Full Expression, and the 2013 GA Women’s Conference. Speak continues to be part of the Apprentice Corporation repertory, giving voice to the challenges they face. Teague also co-directs the Dancing Flowers for Peace and trains artists to teach in underserved communities. She has served as the Program Chair for Moving in the Spirit since 2007.